How do you keep alive the memory of those lost to you, sometimes much too soon, sometimes after long, meaningful connections? When do you take time to recall those who have gone before you…perhaps on their birthdays or the days of their deaths? All Saints’ Day, observed on November 1 on the liturgical calendar of the church year, offers another occasion to reminisce about family and friends we have loved and lost. Seven years ago a fortuitous meeting became the catalyst for me to take a closer look at losses dating back to my teens and twenties. A college mentor, upon learning that I was just beginning to excavate these ancient griefs, suggested the creation of a memorial by which to remember well. As I worked with others to prepare a worship service for that garden dedication, I came across the wisdom of folks like Elizabeth Lesser who writes about Good Grief in her book Broken Open. She says: “There is an art to grieving. To grieve well the loss of anyone or anything—a parent, a love, a child, an era, a home, a job, (one’s health)—is a creative act. It takes attention and patience and courage. But many of us do not know how to grieve. We were never taught, and we don’t see examples of full-bodied grieving around us. Our culture favors the fast-food model of mourning—get over it quickly and get back to work; affix the bandage of ‘closure’ and move on. Sometimes the words of others can serve as a healing elixir as well. John O’Donohue’s For Grief, a powerful recognition of the pain of loss, can be found at this link of daily mindfulness poetry. These words from Gates of Prayer, a Judaism Prayerbook, became another favorite reading of mine as I prepped for the garden dedication. Written for the arrival of the new millennium, the Spirituality and Practice website posts this piece as a reference to the power and the presence of the saints in our lives. 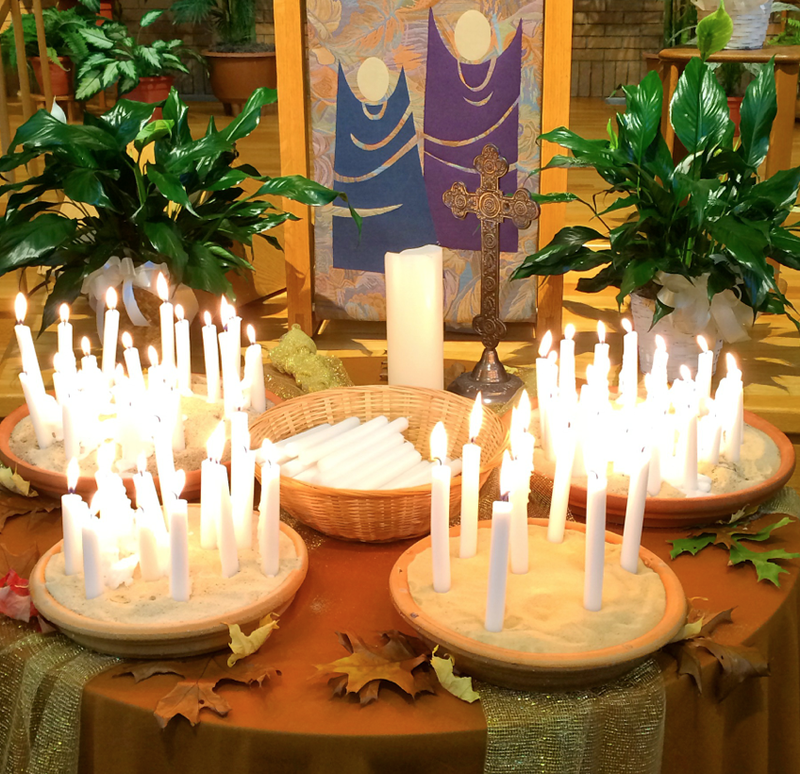 Back in 2005, I collected these words (surely a compilation of thoughts from a variety of resources I had been reading) to share as worship leader during the first All Saints’ Day worship observance in which I participated. I have not forgotten the power of them: We rejoice in the lives of those whom you have recently drawn into your eternal embrace, and we raise their families and friends into your strong arms of care and compassion in their continuing grief. We thank you today for faithful people in every age who have looked to Jesus as teacher and role model. May we be strengthened by their witness and supported by their unseen presence from the balcony of heaven, that we may run with perseverance the race that lies before us, and, by faith, follow in the footsteps of so great a cloud of witnesses. And now we join our voices with angels and archangels, with prophets, apostles, and martyrs, and with all the faithful of every time and place, who forever sing to the glory of your name, saying: Holy, holy, holy Lord, God of power and might, heaven and earth are full of your glory. Amen. These many years later I remain transfixed by phrases like “balcony of heaven” and “cloud of witnesses” along with the idea of joining “our voices with angels and archangels” as I remember those I have loved and lost. In what ways do you remember those you have loved and lost? How do those memories nourish you? So that those who knew him would not forget him, I created this YouTube video of still shots of my youngest brother, who died when he was 18. This video depicts some of the scenes of the garden dedication at my high school four years ago.